Terminal World begins in a Department of Hygiene and Public Works where the telephone has a black handset and a dial. This opening primes the reader to expect a 1950s world, an expectation which the following pages gently perturb. There are references to angels with propulsion harnesses; to the city's underlying fabric and the fact that "[n]o one had ever bothered giving the black stuff a name because it was as ubiquitous as air" (p. 5). The noir setting is built further by the terse language, and the fact that our protagonist, Quillon, is the morgue pathologist. He is not a native of the zone of Neon Heights. A former spy, he is in hiding from the authorities of his adopted home and from his own people, higher up Spearpoint, a spike wide enough to house millions on its spiral flange and high enough to reach beyond breathable air. Now he has to go on the run. Quillon’s escape from Neon City provides an early opportunity for Reynolds to demonstrate the zones of Spearpoint which shape much of the culture of the book. These are rather schematic, their nature apparent from the names of the regions of Spearpoint. At the base is Horsetown; above that are Steamville, Neon Heights, and Circuit City. In the lofty heights, the resident "angels" have wings and propulsion packs which enable flight, but the limits of technology are pretty clearly defined by the names of each of the districts of Spearpoint. For technology, crossing to a lower zone means destruction; for the living, who have a natural affinity to the zone in which they were born, crossings in either direction are unpleasant. Some are less affected, and appropriate drugs alleviate the effects, but I never fully understood whether or under what circumstances these drugs continued to be necessary. As a result, it felt rather as if crossing zone boundaries had exactly as much effect as the plot needed. Quillon descends from Neon Heights and escapes Spearpoint in the company of Meroka, a foul-mouthed death-dealing mercenary who would immediately kill him if she knew what he was. They head into the surrounding countryside as a disastrous Zone Shift strikes; the zone boundaries move, technology collapses, and the populus is decimated. As the vista expands, it becomes clear that the whole planet is zoned, and we begin a steampunk planetary romance. Almost all that is left of the noir opening is the way Meroka comports herself. Now we have a thrilling adventure with airships. There are big ideas lurking in the book, but the focus is on getting all the iconography in place. This is an odd contrast with Reynolds's handling of his earlier novels. Revelation Space (2000), his first book, was big, gothic space opera and Reynolds's imagination ran wilder than his plot could quite keep under control, but there he was contributing to the field, adding his own elements even where his work reflected the heritage of the style. The contrast between Terminal World and Century Rain (2004) is even more marked. The latter was Reynolds's first novel outside the Revelation Space sequence, and as in Terminal World a noir-ish setting is revealed to be encapsulated by something larger. But it shows a much surer touch in generating and populating a new world. 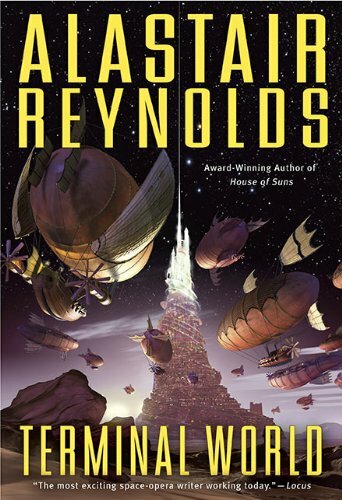 In Terminal World , Reynolds seems to be constrained by the conventions of steampunk. This world is meant to be tired, but surely it isn't also meant to be clicheé? Perhaps this is a result of the protagonist's nature. He inhabits his world so well that he rarely experiences a sense of wonder, even when confronted with the remarkable. It is likely that that the "Carnivorgs" are the most memorable element of the story simply because they lead Quillon to horror and visceral disgust. These beings are fascinating monsters, cleverly utilised, being intelligent machines which integrate fresh flesh—and brain matter—into their bodies to keep themselves operable. Quillon and Meroka end up in Swarm, a fleet of airships which roams the cold, dry planet. A vast array of vessels varying in size, age, and repair, bound to each other by necessity, Swarm is immediately reminiscent of the ship city in China Mieville's The Scar . Unlike the sea city, though, these air ships have a close to uniform society. The descendants of a military operation, they consider themselves to be lawgivers, engaged in a mobile peace keeping exercise. Less sympathetically, their motivation appears to be more about maintaining supply lines than desiring order amongst the ground dwellers. As we learn how Ricasso engages in science, Reynolds does a tidy job of laying out clues about the world for the reader whilst allowing them to pass by the protagonists. However, he chooses not to explain the deep history of the world which we can almost perceive, and keeps the spine of the story with Quillon. Quillon is guided by a self-imposed duty to protect a pair of ground dwellers that he and Meroka saved shortly before they were collected by Swarm. That overwhelming protectiveness seemed to have occurred purely for plot reasons until I understood quite what Quillon's character is. This slow realisation on my part was crystallised by having Quillon baldly state, late in the novel, that he had "moved on. Realised I wasn't the centre of my own universe. Wasn't even anywhere near the centre" (p. 478). Quillon is not a scientist, not even all that curious. He is not in control of this plot; he has never thought of engaging with the world through experiment. This is a startling contrast with the typical SF protagonist. Take Kerin, in Jaine Fenn's Consorts of Heaven (2009), another novel with a sky-tower that is the key to the world. She is intelligent and highly curious, thoroughly focussed on asking the questions the reader wants answered to understand the world. 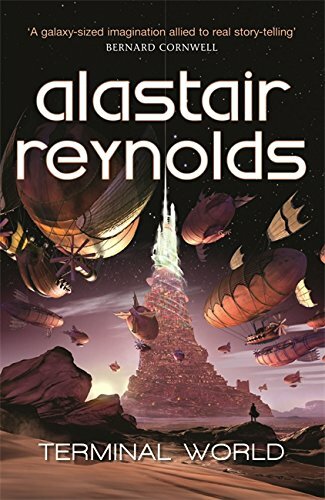 Instead, Reynolds seems to have written a novel of character in a steampunk setting, a book where the relationships between people is the core of what matters and the setting is furniture. Perhaps I should have been paying more attention to Quillon's spat with Meroka; his growing trust of Ricasso; his relationships with the airship Captains, rather than attempting to understand the world. If this is what matters to the novel, Quillon is no longer a bystander in his own book. He throws in his lot with Ricasso because he cares about people and sees Ricasso's party as humane. He is equally prepared to put himself in danger to protect those he considers his responsibility. The writing expresses this quite badly at times ( "I won't leave my patients. I can't say I've been much use to either of you, but I am still your doctor" [p. 464]), but it is Quillon's most sincere attribute. The pages are filled with alarums and adventures, reversals, betrayal, and frightening experiences—as many as one would hope for from a planetary romance. Quillon builds genuine relationships after leaving Spearpoint as he is able to acknowledge his own nature, overcomes default hatred of his type, and becomes a valued member of his society. Still, Terminal World opens up a number of interesting ideas about the nature of its world but doesn't settle any of them, which makes the book rather frustrating as science fiction. It will be fascinating to see what audience this novel finds. Duncan Lawie grew up in Australia and lives on the Kent coast. His work also appears in The Zone . I found the book good but far from the superior work I expected from Mr. Reynolds and for me the reason was that Terminal World switched almost randomly from a steampunk adventure mode to investigating the mysteries of the world and mostly explaining rather than actual showing how weird the whole zone thingy is - once you think about it, even the simple thing of "real as in determined by physical law rather than superstition" human castes based on how "smart" they can become in a given zone is a concept worth of a book in itself. That led to the lack of focus and the jumping around feeling that I had when reading the book, while the choice of Quillon as lead character did not help imho, and there were some truly cringing moments here and there, though lots of great stuff too. So far this is the best review I've read on "Terminal world". I can only add that I was very disappointed by the book. My former idol, Reynolds has fallen from the skies. I am put off by clumsy dialogue on Reynold's recent long books. Same applies to this one. And this feel also like another attempt to have action movie made of his book. Though not so much as Century rain, which was a B-class action movie with slight action comedy spirit.